From friendship advice to romantic encouragement, this is where you’ll find a sweet little glimpse into my most precious relationships. "Friendships don't magically last forty years... you have to invest in them." As my TV idol & forever fashion icon, Carrie Bradshaw, says - friendships take some work! Growing up and moving out can mean a lot of things to many different people, but when it comes to your beloved girlfriends, moving away can take a toll on your friendships. Heading off to college and leaving your high school BFFs for the first time can be heartbreaking. Or perhaps the heartbreak came when you graduated from college and got a job, forcing you to leave the laid-back lifestyle of lounging around with your roommates for hours on end while binge-watching Pretty Little Liars behind. Or perhaps your bestie moved in with her significant other and your treasured days of eating out and nights of bar-hopping are sadly behind you. Whatever your situation may be, it can be tough trying to maintain that closeness with a friend that you no longer have the luxury of seeing everyday. I've made some amazing friends throughout my life, and each relationship holds a special place in my heart because each one meant something different to me. Needless to say, I truly believe that God puts people in our lives for a reason (yes, even that one annoying ex-boyfriend, or that terrible boss) to teach us, mold us, and move us. I've grown apart from some girls who've played huge parts in my life, and I've grown closer to some girls who I've known since I was a child. 1. Always remember that it takes two. I often find that when I'm growing apart from a friend, I'm quick to play the blame game. "She never calls me to catch up anymore," "She doesn't even know what's going on in my life right now," or "I guess she's just too busy for me these days." Ugh- complain much, Alexis? It's interesting though, because the phone goes both ways. In order to keep a friendship going while the miles between you seem to add up, both friends need to make an effort. Shoot your friend a Tuesday morning text that says you're thinking about her, or tag her in a funny Instagram post! If something exciting happens to you, like a job promotion or scoring a date with that cute guy you've been eyeing at the gym - text her about it. Make it a priority to let her in on the important things in your life, and chances are she'll do the same. We're at a crazy time in our lives, where being in our early twenties means we're finishing up school, starting our careers, managing our finances independently for the first time, and trying to balance working out when you get home and reeeally wanting Chinese takeout for the 3rd time this week. It's wildly exhausting but so insanely invigorating, so give you and your friend a break and start fresh. 2. Make a point to visit. The girls and I took a trip just last week to visit one of our friends that lives in New York- cueee these awesome pictures! It took us 3 years to finally make it out there and see her cute little life that she's made in Long Island, but now that we're a bit more established financially since our college days (well, just barely) we managed to make it work. It's important to not only make an effort to talk more over the phone or via text message, but also that you actually take the time to put your life aside and go spend some real, in-the-flesh time with your girlfriends. 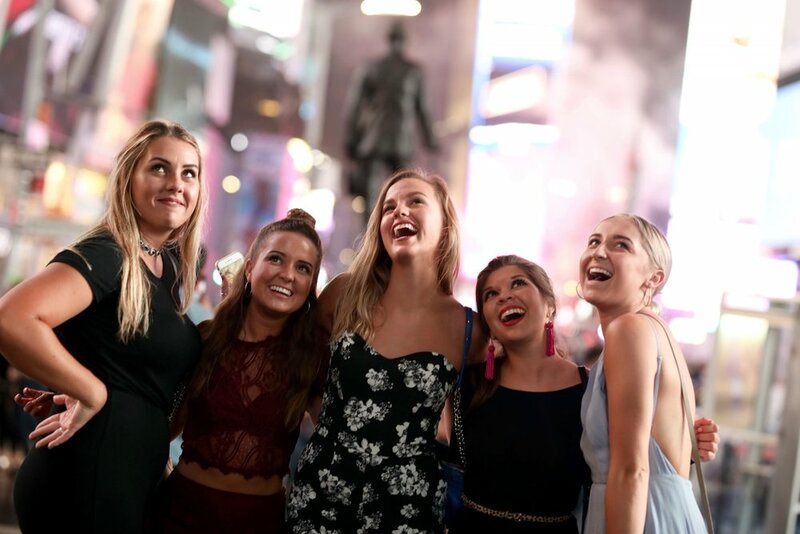 And hey, maybe you'll get extra lucky and a professional photographer will catch you and your friends taking a selfie in Times Square and then insist on having an impromptu photoshoot! 3. Take a trip together. Needless to say, me & my friends love a good vacay... A couple of us took a Spring Break vacation to Mexico this past March and had the time of our lives (read about that trip here!). We all live in different places, and it was so amazing to kick back and relax for a week in paradise. It's really a cool thing- seeing that we all went to different colleges and though we would meet up each time we came home for Holidays, we've grown closer than we've ever been now that we're graduated from college and living our own lives, spreading across 3 different states. Though it may not be financially feasible for everyone to take a trip to downtown NYC or spend a week on the Mexico beaches (we got insanely lucky - hello, Cyber Monday deals!) it is feasible to take a weekend to spend some time with your girlfriends. 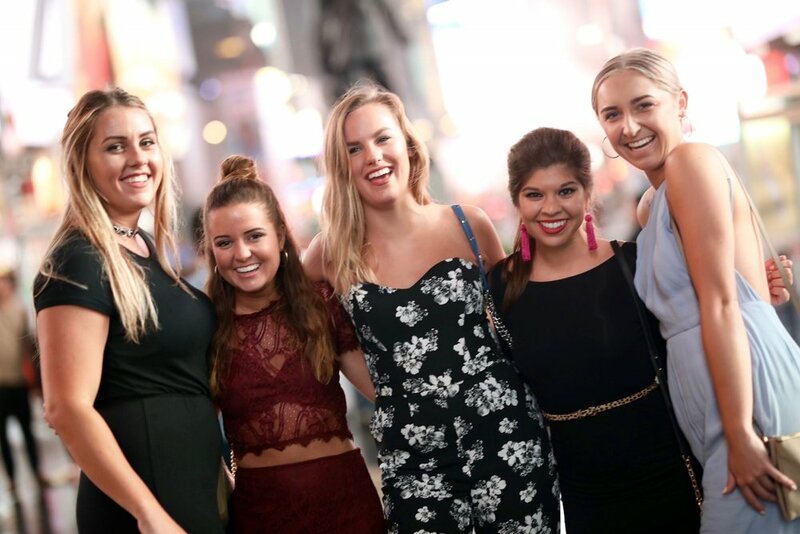 Find a time that works for all your high school gals to go back home for the weekend to catch up and eat at your favorite Thai restaurant, or have the college crew plan on attending the Homecoming festivities in the fall (can you say, recreate those old bar crawls we used to go on?!). Spend a weekend at a winery, or get a hotel in the nearest big city where you can eat, shop, and treat yourself to spa pedicures and massages for all. It really isn't that difficult to get everybody together, and the hardest part is just deciding to do it. So make the move, and get something on the calendar! 4. Stop letting social media define your closeness. Text messaging & social media make it really easy to stay connected with our network of friends, but at times it can also get pretty overwhelming. I often find myself spending the majority of my time spent on social media liking a friend's picture of her brunch spread rather than actually engaging with her on what's going on with her emotional Instagram post. Is "double-tapping" an Instagram photo the new way of staying connected? Does staying in the know of our friends' photo-worthy moments take the place of actually keeping each other informed on our lives? 5. Stay active in their life. Most importantly, if you want them to play a role in your life then it's only right that you play a role in theirs. Dive deeper than that monthly check-in convo simply getting caught up with what the current scoop is. If a friend tells you they're really struggling in their relationship, then make a point to check up on them more often than usual. Call them up on your ride home from work and talk them through their hardships. Offer to listen to them vent, and be their ~virtual~ shoulder to cry on when they're feeling helpless. And on the flip side of that, be excited for them when things are going right. Be their biggest cheerleader and their number one supporter. Let her know when her outfit just isn't doing it for her via that Snapchat she just sent, and give her all the praise when she looks hot hot hot. Because even though growing up and moving away may separate us from our girls, what kind of friend would we be if we didn't tell our BFF that her shoes just do NOT go with that dress? To my friends that I've grown apart from, I still love you. I thank you for the memories and I'm so happy to have had shared the precious moments we had together. To my friends that I talk to regularly, I thank you for choosing to stay my friend even though I can be incredibly annoying at times like when I insist on going to the Italian restaurant for dinner even though we're both on a diet, or when I talk too much to the Uber driver en route to the bar. My heart is overflowing with love and gratitude for the women that have been and are currently in my life that have each taught me how to be a better woman. Moving far away from someone doesn't mean that you aren't close anymore, in fact- it could mean the very opposite. Don't let distance define your friendship, and relish in the beauty of a relationship that can span miles, years, wild ex-boyfriends, and that awful haircut from sophomore year. Our girlfriends are such a beautiful addition to our lives because even though they may not be immediate family members, they can still feel just like sisters. Boys will come and go, a bad job is only temporary, and those furry slide-on sandals are sure to go out of style soon, but your friendships are forever.